Verdure Chantilly II tapestry shows a scene of the forest with a manor in the midground. A pheasant is seen frolicking in the tree, filled with details in the leaves which shows a gorgeous array of colors and tones, from golden creams to mid greens to darker greens. The manor is seen beside a river and the eye is also led to the left to the distant trees and mountains with another manor in the background. Chantilly is a region of France which includes the Chantilly forest, and was the home to royalty in the 17th and 18th centuries and horse riding. An ornate floral border completes this work that is inspired by the original French verdures from the 17th century which brings the beauty of forests and flora to the indoors of palaces, royal homes and more. 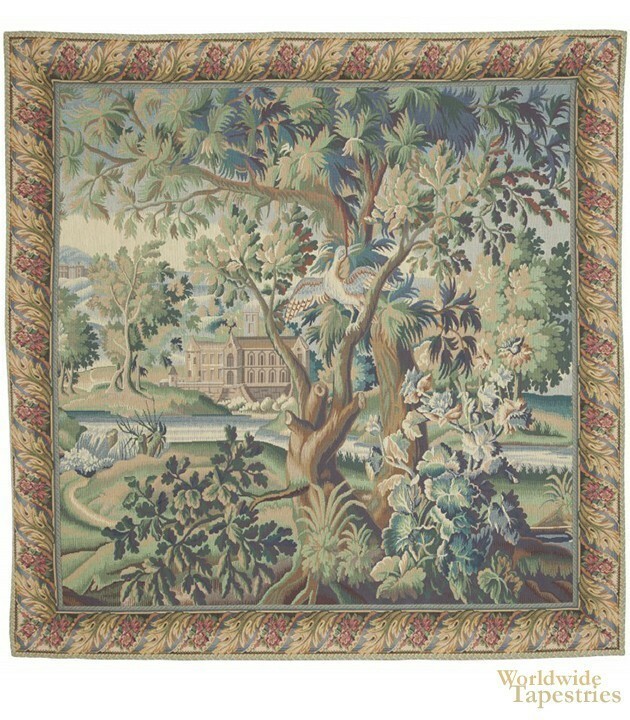 This tapestry Verdure Chantilly II is backed with a lining and a tunnel for easy hanging. Note: tapestry rods and tassels, where pictured, are not included in the price. Dimensions: W 64" x H 64"